Hi, Please introduce yourself to our readers. We are a couple from India. Software engineers by profession. I quit my corporate job to spend more time with my daughter and enjoy this phase of life. We started travelling in India to get away from our monotonous 9 to 6 jobs and soon travelling became an indispensable part of our life. Soon after our angel daughter was born we came to Switzerland on an onsite opportunity and grabbed this opportunity to explore Europe. What is the first trip you remember taking together? The first trip we took together was to the southernmost point of India - the Kanyakumari in 2007. Incidentally this is the trip where we were introduced to each other. We were on our training for our first job and our common friends had planned this trip. We did have a couple of them but they were worth the trouble! 1.After visiting Etretat we had to catch the last bus from Le Havre to Caen where we had booked our apartment. Due to heavy traffic, the bus from Etretat reached Le Havre late and we ended up missing the last bus to Caen. We were obviously annoyed but then decided to take a taxi. Taxi was probably a better option since we were travelling with a kid. 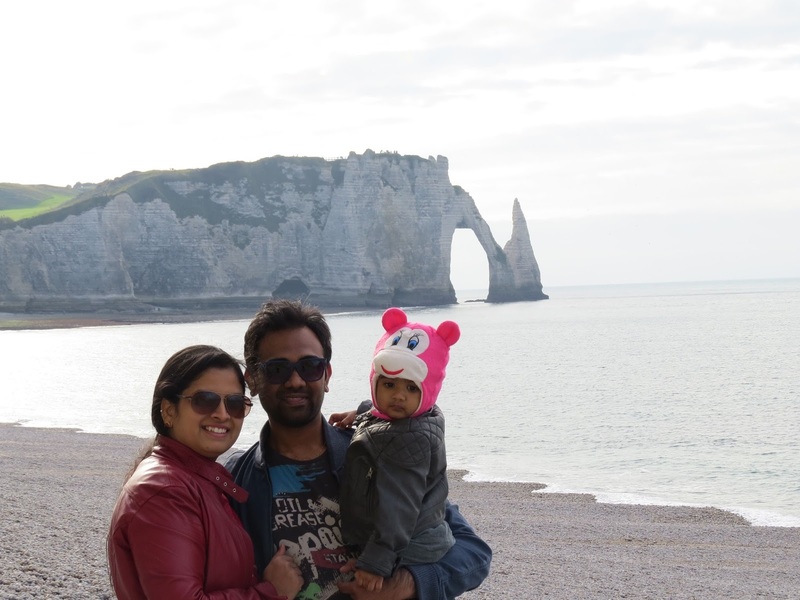 And it gave us an oppurtunity to see the area, Etretat is so beautiful. 2.When travelling back from Edinburgh to London, our scheduled train got cancelled and we had to take the next train which was jam packed due to combined passengers from both previous and current trains. We had to sit on the train floor due to unavailability of seats. After about 10 minutes or so, we decided to have a chat with a train cafeteria employee, we got offered seats usually reserved for the staff. Later on, they arranged seats in first class for us. So all is well that ends well. How do you decide on a destination? We had initially planned to cover all the neighboring countries of Switzerland, when we started travelling. But later on, we decided to visit locations that intrigued us, for instance: Etretat white cliffs, Mont Saint Michel and American cemetery (Normandy), Eiffel Tower (Paris, France), Neuschwanstein Castle (Germany), Santorini Greek Island (Greece). 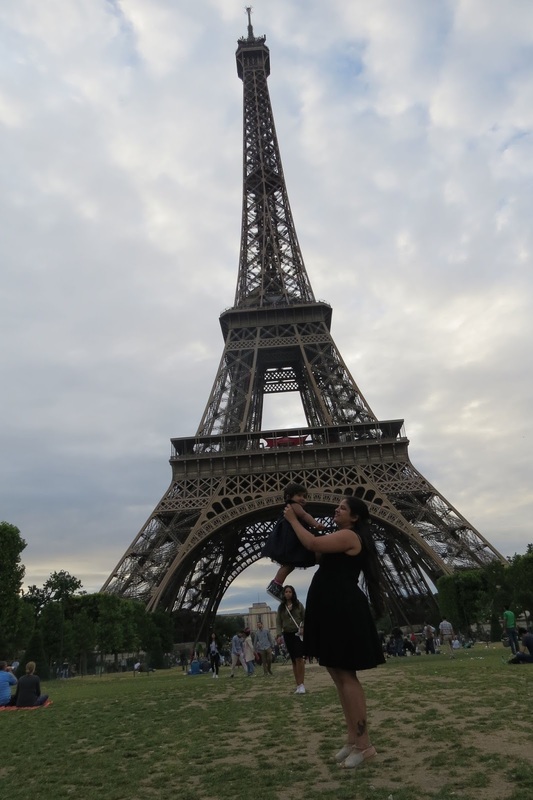 Rashmi with Chhavi in Paris. Do you have a bucket list? If so what is on it. 2. Seven sister states of northeast India. If you were not travelling, what would you be doing instead? We would definitely be travelling but maybe not to international destinations. If not for the opportunity to work in Switzerland we would have found it harder to visit these countries. Once back in India, we are planning to save our pennies to continue pursuing our passion for travel. Car. It is always great to take wrong turns, explore the unexplored, stop whenever you want and start again. Travelling by car, we have many atimes changed the complete trip schedule by visiting new places or adding on new unplanned stops. Many people are afraid of travelling with children, what is your best advice to make a family holiday a success? After having kids life changes, your lifestyle changes and you adopt new habits. You become more patient, more organized and multitasker. All these qualities help you become a better traveller. A little patience and preplanning would make your travel with kids more memorable. How many countries have you travelled to so far? Do you have a dream destination you haven’t managed to go to yet? Including India, we have travelled to 19 countries so far. Our Chhavi has accompanied us to all the countries except one, our honeymoon to Malaysia! Yes, Turkey has long been on our wish list! You visited many countries: do you have a favorite so far? In which countries did you find travelling with children the hardest? Why? Our favorite will always be Switzerland. It is a paradise for travel lovers and great to travel with kids too. 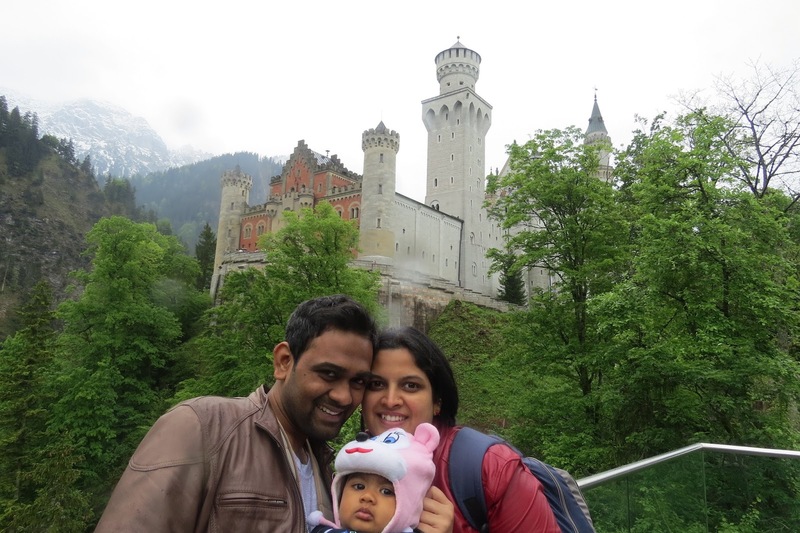 So far we have covered the countries in Europe and Europe is best to travel with kids. How did you find travelling with a 6-month-old? We have learnt a lot with time. We always plan ahead, book all the tickets to attractions in advance to avoid the queues. We have to carry extra set of clothes, food, toys. Everything and anything, we think may or may not be required. If it was only the two of us, we would have travelled without booking hotels with just a pair of jeans and shirts. Survived on limited sleep, biked through snowcapped mountains, hiked through rainy forests and stayed in villages, travelling without any planning whatsoever! But kids change you a lot, don't they? Were there any surprises while travelling with a child? We have been denied rides in Switzerland. Recently we cancelled our long planned trip to Mont Blanc because they don't allow kids below 3. We had to cut short a trip to Venice because the weather turned out too windy. And wasted a day in Florence because it started raining suddenly out of nowhere on a sunny day. If it was for the two of us, weather wouldn't have mattered much. What kind of packer are you: carry-on only or everything in sight? Is there one item you never leave home, no matter where you go or how long for? As for two of us it is simple: jeans and pair of shirts. As for our daughter, we have a two-page checklist depending on whether it is a day trip or night stay. 90% of our luggage is stuff for our daughter. We pack everything for her considering all climates. And the one thing we never leave home without, is our daughter's teddy. 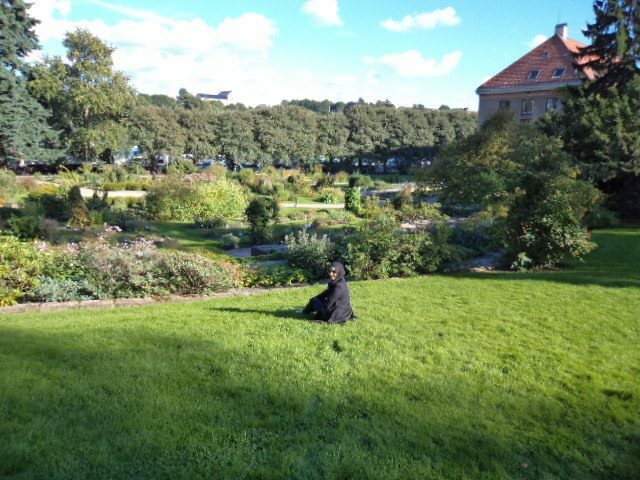 Our daughter wants her teddy beside her all the time, while she is having her food, sleeping or running around in the garden. How do you prepare for a trip? Which website do you use to make travel and accommodation arrangements? We use Airbnb for apartments. And we book flights ourself after some research. Do you get travel anxiety? How do you overcome it? Yes, we do get anxious sometimes because we are travelling with a kid and we are not sure how the facilities, weather and, in general, thecity would turn out to be. But until now Europe has not disappointed us in anyway. Europe is in fact the most kid-friendly of all places, with clean diaper changing rooms, washrooms and stroller friendly public transport. We take complete care to have the sightseeing maps, tour circuit, public transport information, bookings and tickets printed out. We check and recheck them several times to see if we have missed out on anything. What do you bring back from your trips? What’s your favorite souvenir? We are not very much into collecting physical souvenirs. We have a couple of collector boxes, a Venetian mask and tiny Eiffel towers. But our best souvenirs are the pictures we took and the memories we made, which we are going to cherish for a lifetime. 1.On our way back to Geneva from Prague, we reached the airport on time and looked for our flight's check-in counter and were surprised not to find our flight details. On enquiring with information counter, they said that no such flight exists. We were in an utter shock didn't know what to do and waited there at the counter. Then after 5 to 10 minutes the lady called up and confirmed with someone and told us that the flight was cancelled and they gave us tickets for some other flight to Geneva which was via Amsterdam. 2.Our first international trip was to Italy and we decided to drive all around Italy. Verona was our very first stop. Unaware of the fact that our GPS setting was wrong and was set as to exclude all highways, we drove through several villages on gravel filled roads for an hour or so. We were so confused as to why there was no highway connecting Geneva to Verona. Then we realized our mistake and corrected the GPS setting. 3. We have had a couple of experiences where we had to run through the airport to catch our flights. When returning from Lisbon we came to the airport well before time, almost 3 hours early. We were happy that this time we would not have to rush through and it would be a relaxed flight back to home. Unfortunately only 30 min before boarding we realized that we were waiting in the wrong terminal and again had to rush through the airport. Even worse, we had to take a 10 min shuttle to the other terminal and so the story repeats itself! You can connect with Rashmi and Chalukya on Facebook and Instagram too!